To see photos, traveler tips, and tourist information, go to the Bryce Canyon National Park online attractions planner . Zurich, Switzerland to Bryce Canyon National Park is an approximately 16.5-hour combination of flight and car. You can also do a combination of flight, bus, and car; or do a combination of train, flight, and car. Traveling from Zurich to Bryce Canyon National Park, you'll gain 8 hours due to the time zone difference. Expect a bit cooler evenings in Bryce Canyon National Park when traveling from Zurich in May, with lows around 0°C. Wrap up your sightseeing on the 13th (Mon) early enough to drive to Kanab. Kanab is a city in and the county seat of Kane County, Utah, United States. Kick off your visit on the 14th (Tue): hit the best photo ops around with an inspiring photography tour and then identify plant and animal life at Best Friends Animal Sanctuary. Plan my trip to Kanab with suggested itineraries provided by Inspirock. Traveling by car from Bryce Canyon National Park to Kanab takes 2 hours. Expect a bit warmer temperatures when traveling from Bryce Canyon National Park in May; daily highs in Kanab reach 28°C and lows reach 5°C. Wrap up your sightseeing on the 14th (Tue) to allow time to drive to Moab. 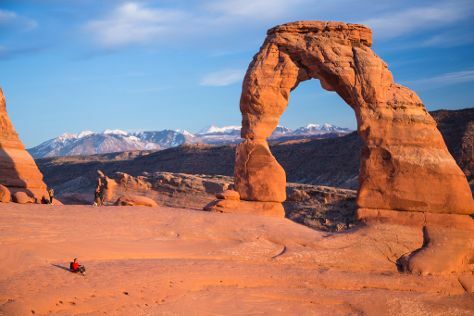 Kick off your visit on the 15th (Wed): take in the awesome beauty at Arches National Park. On the 16th (Thu), you'll have a packed day of sightseeing: admire the majestic nature at Dead Horse Point State Park and then take a tour by water with Boat Tours & Water Sports. For traveler tips, photos, ratings, and other tourist information, you can read our Moab trip itinerary planner . Drive from Kanab to Moab in 5.5 hours. Alternatively, you can do a combination of shuttle, bus, and car. Traveling from Kanab in May, plan for a bit warmer nights in Moab, with lows around 11°C. Finish your sightseeing early on the 16th (Thu) so you can travel back home.